Made this comic last year for Comic Party http://comicparty.dk/ which is why you get two comics about German/Danish relations in a row. Anyway, when Denmark briefly got a bit of it's border control back last year (stopped 1 in 100 cars or something like that) the Germans didn't just complain that it was against European agreements, but also took it as a very personal attack on them, probably because Germany is the only country connected to Denmark by land. Well, Germans do like to invade their neighbors. And dig holes. @SchrodySweden That's good! It'd be a real PANE to your Finnish friend if you didn't know anything! @DanishPride Indeed. We'd probably SILL be practically strangers if I hadn't had that info to help me break the ice. @SchrodySweden Thats true. Or it would take tranSOME more time. @DanishPride OK I have to admit I don't get this one. Maybe I can LOCK onto the meaning in time, but so far the KEY to this pun eludes me. I’m sorry, Germany, but isn’t it a bit creepy that you were outside my house the entire time? Wow, Denmark. Way to go. 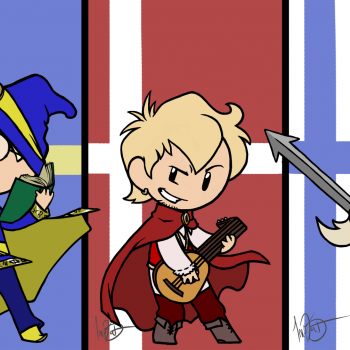 @satwnhetafangirl denmark is like 9 times older them germany. @Balistare since when do germans dislike paperwork? 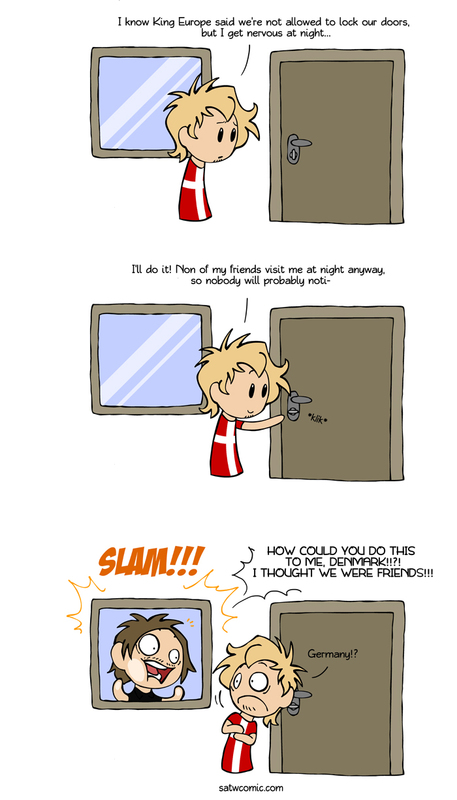 I can just imagining German saying "I love you baby" to Denmark through that window.